It's Facebook Fridays! for November 30, 2018! Are you ready to take charge of your situation? Here's your chance. The Lucky Mojo Curio Company is holding a random drawing to give away 8 power-enhancing Commanding spiritual supply prizes, so that you can gain the power to lead, govern, and direct the activities of others. 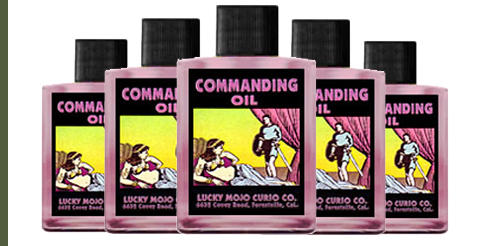 This week each lucky winner will get a bottle of hand-made Lucky Mojo brand Commanding Dressing Oil to anoint your body, your tools, and the places that your colleagues touch. 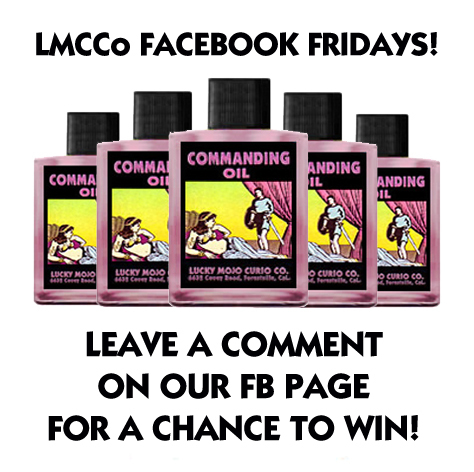 First thing tomorrow morning, we will select EIGHT winners at random, announce their names here, and ask them to message this Facebook Page with their mailing addresses, so we can send them their FREE Commanding OIL. Thanks, Ernie, for posting this at the Forum. All y'all click that link and get on over to Facebook to enter the contest now, y'hear? Winners will be chosen around noon Pacific Time on Saturday. We have a winner! In fact, we have 8 lucky winners! Our Facebook Fridays! winners for November 30, 2018 are: Jessica Love, Ed Maldonado, Elle Steranko, Debra Elam Augusts, Yulanda Ramsey, Tabitha Nadia Davis, Josy Smith, and Sylvia Tsang.